This stunning flower basket bouquet tile mural adds beauty and texture to any backsplash. The mural measures 23" x 18" when installed and includes a rope border. There is exquisite attention to detail in this hand-crafted, relief mural. Made in the United States by an artisan that understands the craft of tile making and learned the the importance of detail through painting. the mural comes in a matte finish. This hand-painted bouquet mural is framed by hand-crafted rope trim and pairs perfectly with natural stone like travertine or granite. The intricate details create artwork that is timely, lasting, beautiful and functional. Creating a striking mural backsplash isn't hard. But, don't forget to follow a few important and helpful tips. Want to see more images of this mural? Just click to the Flower Bouquet Mural Installations slide show. A stunning mural creates the focal point of any room. With limitless mural tile options, it is hard to know where to start. However, nothing creates more attention than a custom hand-crafted tile mural that will be noticed and revered for a lifetime. Your mural is an object d'art so make sure to resist the trendy and the hip to get limitless years of joy! These two "Tree of Life" Pomegranate Murals are incredible pieces of timeless tile design--perfect for a kitchen backsplash, fireplace mantle, or tiled entryway. Custom designs like these are made-to-order, unique and require about 6-8 weeks of painstaking expert craftsmanship to create. Match the mural's scale and shape to the surrounding area. Use a square mural for a square space. The mural should "fit nicely" into the area. Don't forget about Goldilocks and the three bears: not too big, not too small, it should "feel" just right! Use some of the mural's colors in field tile that surround it. Try adding a border or "picture frame" to the mural using an accent color from the mural. Surround the "artwork" with a "matte" of tile. Use a neutral color from the mural. Use smaller "dots" like 2"x2" for more texture. Use larger formats up to 6"x6" for a more traditional look; but place them "on point" to "set off" the mural. Make it unique and make it yours! It's your space: choose a design that matches your sense of style! GirStone pavers are hand-made with natural materials. This unique product creates the look of cobblestones and flagstones. They are so realistic, you can't tell the difference. GirStone pavers are great for landscaping, commercial architecture projects, residential patios and pools. These pavers are durable and versatile. You can mimic the ancient cobblestones of Europe, create a modern look or a rustic feel. GirStone pavers have anti-slip qualities, even when wet! They are perfect for pool decks, pool coping or outdoor patios. In addition, they are extremely durable and frost resistant. Hand-made from natural-occurring products, they are air-dried which is great for the environment. GirStone pavers are considered a green product! The GirStone line comes in three colors: cream, gray, and red. The appearance of these pavers only improves with time and wear. Shown is a cream GirStone installation after several years. A "patina" has developed from use and the elements that adds character. Remember, GirStone pavers are a green product. They come in various thicknesses for either commercial or residential applications or high and low traffic areas. 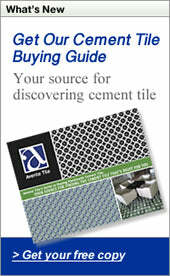 To obtain pricing and quotes for this incredible green product in North America contact Avente Tiles. GirStone Pavers are manufactured under license in the Dominican Republic by Aguayo Tiles. Are you having trouble deciding how to use a beautiful decorative tile? You love the tile colors, the unique design, and the stunning pattern. However, does an entire wall of this fabulous tile seem like too much? Don't worry, it's OK to use just a few decorative tiles as an accent. The size of the deco tile does not have to be the same as the field tile. Use tiles randomly or in a different pattern than the field tile to help "set-off" the design. Check out these great examples of deco tiles used as an accent. A simple assemblage of four, six, eight or twelve tiles makes a great medallion for a kitchen backsplash, shower focal point, or fireplace mantle. Use a row of deco tiles just above the countertop for a kitchen or bath backsplash. Create a "chair rail" in the wainscoting by placing the tiles in a row. Alternate a few decos randomly "on point" with large format flooring.